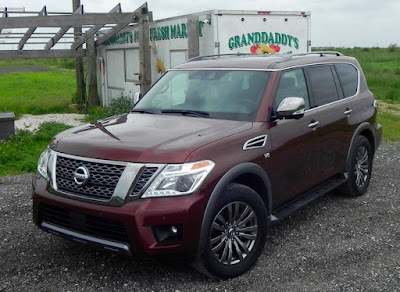 They say that good things come to those who wait, and though as far as I know no automobile company has, like Guinness and Heinz, picked up on that as a slogan, it is what came to mind as I drove the Nissan Armada for a week. 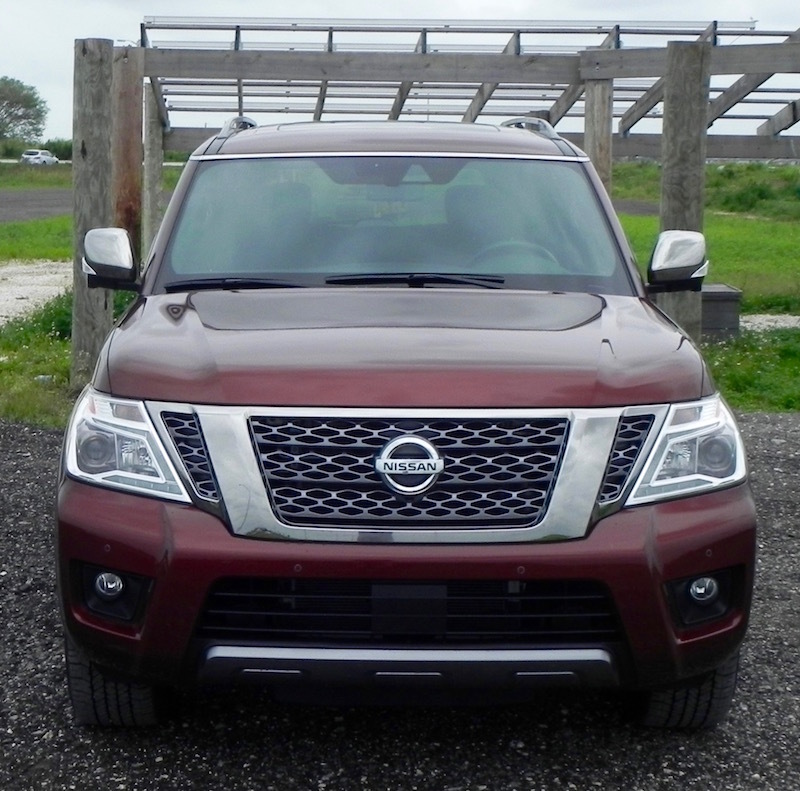 The flagship of the Japanese manufacturer’s portfolio of SUVs and crossovers, Nissan gave the the Armada a big makeover for 2017. It got a fresh exterior design, a new 5.6-liter V8 engine mated to a new 7-speed automatic transmission, and several new available safety features like Predictive Forward Collision Warning, Blind Spot Intervention, Backup Collision Intervention, and Around View Monitor with Moving Object Detection. 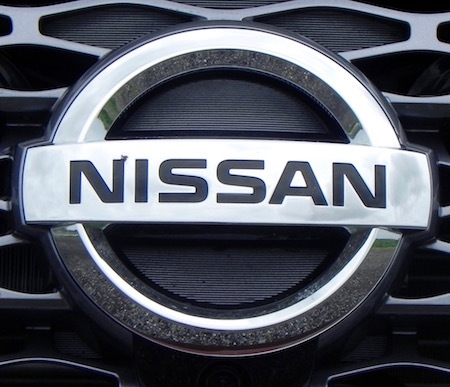 The inside was roomy with lots of high quality materials giving the cabin a premium feel, and the top-of-the-line Platinum edition features a power-sliding moonroof, front climate controlled seats, a Family Entertainment System and Nissan Safety Shield technology as standard. Instead of the Nissan Titan pickup, the 2017 Armada shared its platform withe full-size luxury SUV the Infiniti QX80, which gave it a smoother, quieter ride than is typical of vehicles with body-on-frame construction while still offering more than capable off-road and towing ability. 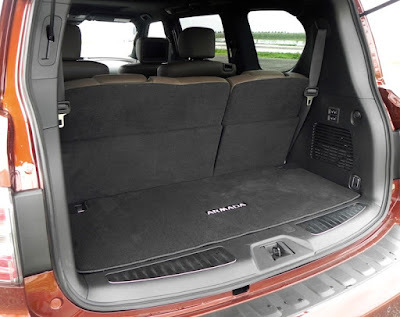 If cargo space was a bit on the short side, the Armada made up for that shortcoming with lots of room for passengers, especially those riding in the second row. But if you missed out on getting a 2017 Armada into your driveway, Nissan has something for you in the 2018 model as well. 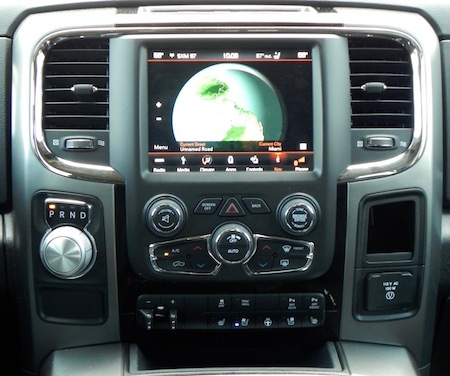 The second-year of the second generation Armada keeps all the good stuff from last year while adding standard NissanConnectSM Services, an 8-inch multi-touch control display, HD Radio, SiriusXM Travel Link with three years of trial access (subscription required), enhanced voice recognition, hands-free text messaging assistant, and additional USB ports for all grade levels. A new model, Platinum Reserve, has been added to the lineup, giving the Armada essentially four trim levels — SV, SL, Platinum, and Platinum Reserve — all in either 4X2 or 4X4 configurations. 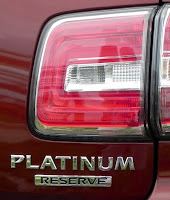 The new Platinum Reserve model boasts dark chrome exterior trim (front grille, door handles, outside mirrors), 20-inch dark chrome wheels, two-tone leather-appointed seats with unique stitching, unique black quartz and premium wood tone interior trim, and embossed "Platinum Reserve" emblem on the console lid. Also, for the first time on any Nissan vehicle, Platinum and Platinum Reserve models get a standard feature that I’m pretty sure you’re going to love. It’s what the company calls an Intelligent Rear View Mirror. It uses a High-Res camera mounted at the rear to project a clear image onto an LCD monitor built into the standard rearview mirror. Flipping a switch at the bottom of the mirror, like you do when adjusting the standard mirror to reduce glard for night-time driving, allows the driver to use either the traditional rearview mirror system or the new Intelligent Rear View Mirror. I would be very surprised if you wouldn’t opt for the camera-based view. To get down to the nitty-gritty, the 5.6L V8 generates 390 horsepower and 394 pound-feet of torque that gives the Armada a towing capacity of 8,500 pounds. All-wheel drive fuel economy is rated at 13 miles-per-gallon city, 18 highway, and a combined 15 mpg using regular fuel. It seats seven or eight, depending on whether the second row has captain’s chairs, and those in the second row get up to 41 inches of legroom, less than an inch those in front are afforded. Third row occupants get just over 28 inches. Cargo capacity is 16.5 cubic feet behind third row, 49.9 with third row folded. MSRP for the new 2018 Armada 4X4 Platinum Reserve model starts at $62,885 including the $1,295 destination and delivery charge, but the base 4X2 SV model is considerably less, starting at $47,385. What I liked about the 2018 Nissan Armada Platinum Reserve: Second-row seats easily flip over to provide easy access to the third row, and the third-row seats are power folding at the push of a button on the right side of the cargo area. 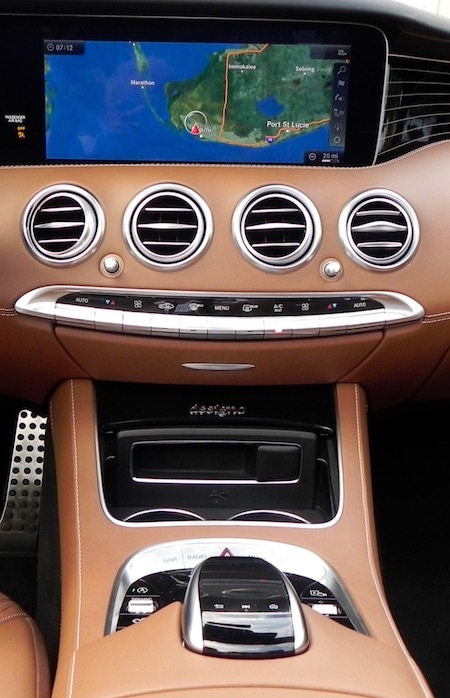 Technology is user friendly, and the high-def rearview mirror (standard on Platinum and Platinum Reserve models) is really cool. 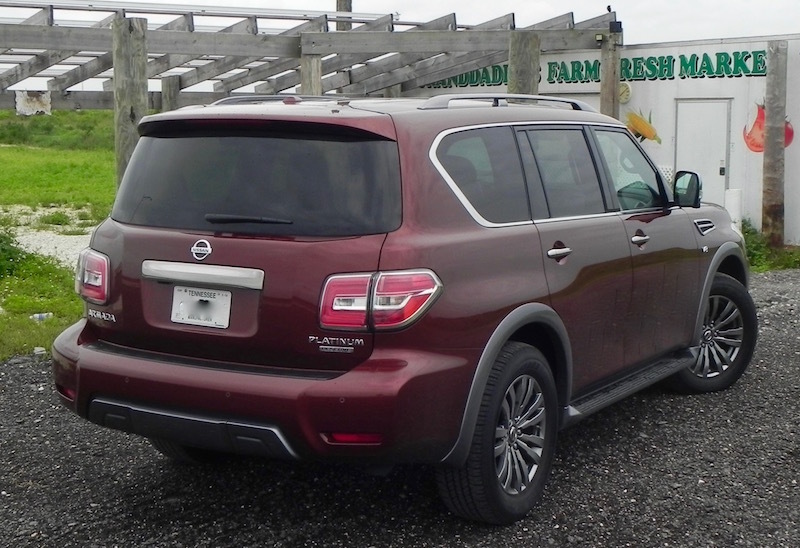 What I didn’t like about the 2018 Nissan Armada Platinum: Fuel mileage figures and cargo capacity don’t match up to competitors. 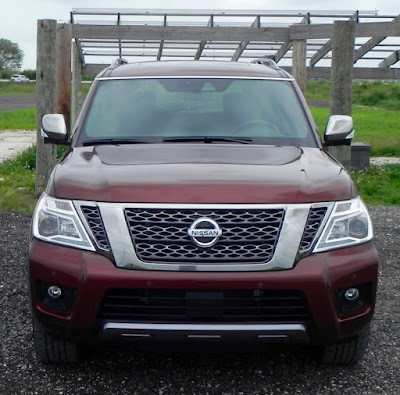 Would I buy the 2018 Nissan Armada Platinum? 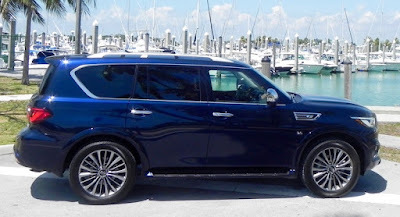 As with its sibling, Infiniti’s QX80, I really don’t have the need for a full-size SUV, so, no I wouldn’t. But it’s worth a look, and the Platinum Edition enjoys a significant price advantage over the QX80. 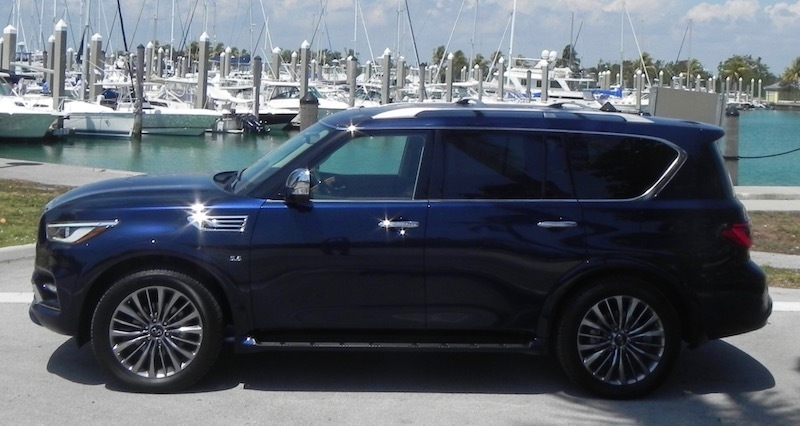 Even throwing in extras like the second-row captain’s chairs and the Platinum Reserve package runs the total to $66,645, still under the $67,850 starting price for a 4WD QX80 and significantly under the $84,660 a fully loaded QX80 might run you. 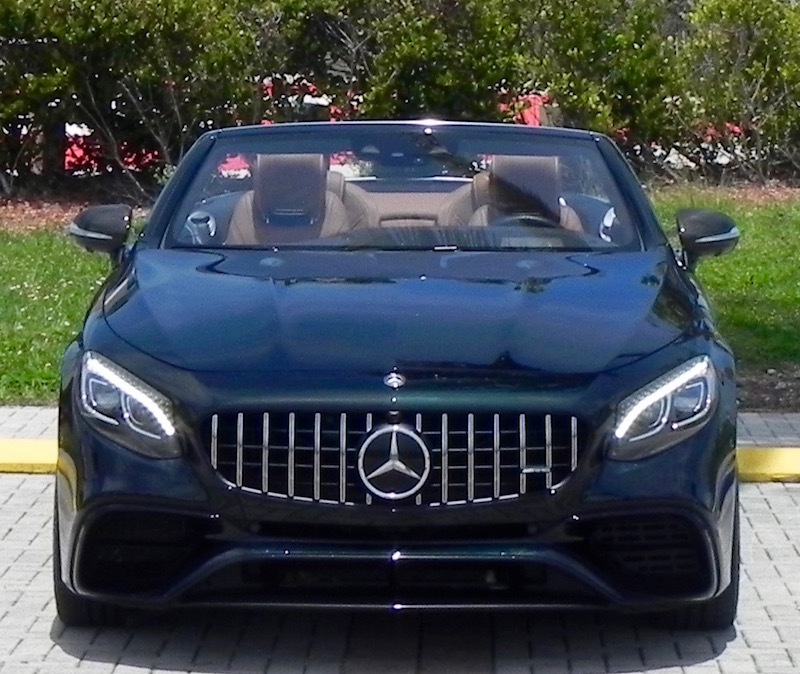 If you’re looking for a vehicle that tells the world “I’ve got it made” yet exudes a more carefree air and fun driving experience than you might ordinarily find in the Super Luxury Class, the Mercedes-AMG S63 Cabriolet may be a perfect fit. 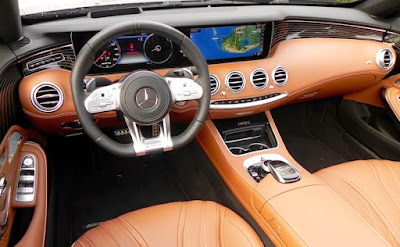 The S-Class has served as the flagship sedan for Mercedes-Benz for quite some time and is always packed with the latest exotic technology (like its infra-red night-vision system for enhanced visual detection of pedestrians, animals and other object in the darkest of conditions) and is the ultimate in luxurious comfort. After bringing the coupe back to the S-Class portfolio from under the CL banner for 2015, Mercedes unveiled its first S-Class convertible since 1971 with the the S-Class Cabriolet a year later as a 2017 model. Like just about any vehicle that the German manufacturer puts its mind to, it’s a stunner. The S-Class Cab comes is offered in three trim levels with the AMG S63 sitting between the S560 and the AMG S65. Its 4.0-liter biturbo V8 engine pumps out 603 horsepower and 664 pound-feet of torque which delivers a neck-snapping, zero-to-60 mph time of 3.4 seconds and an electronically limited top speed of 184 mph (16 mph than what is shown on the speedometer. That’s less horsepower than what the AMG S65 offers with its biturbo V12 (621 and 738, respectively), but a slightly quicker zero-to-60 than the S65’s 4.0 seconds. The biturbo V8 in the S560 is rated at 463 hp and 516 lb.-ft. with a zero-to-60 time of 4.5 seconds. The 2018 AMG S63 gets a 9-speed, AMG Speedshift transmission to replace the 7-speed on the 2017 model. Also, the 4.0L V8 in the 2018 S63 replaces the 5.5L V8 in the previous model and in addition to upping the power numbers from the 2017’s 577/664 also is slightly more fuel efficient with mileage ratings of 15 miles-per-gallon city, 24 highway, 18 combined to the 2017’s 15/23/18. According to government figures (And who doesn’t trust the government?) that will result in your spending about $5,000 more for fuel over a five-year period compared to the average new vehicle. 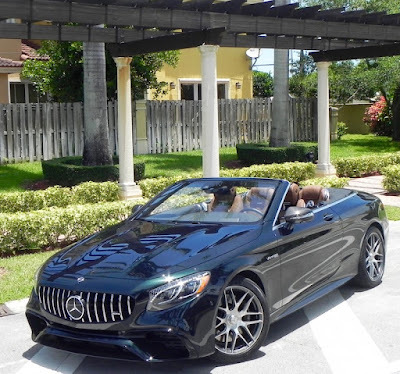 Like, if you’re driving an S-Class Cabriolet, you’re going to care about that. While what’s under the hood is important, what’s in the cabin is impressive as well. 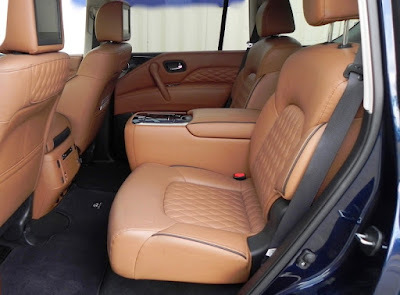 The leather front seats are heated and ventilated and come with an adjustable massage function for both driver and passenger. Despite a multitude of infotainment features, the dash has a clean appearance. That’s because infotainment functions such as audio and navigation are operated via through the COMAND System screen using the ubiquitous knob at the center of the console. A warning that flashes upon starting the engine cautions you not to let the COMAND System not to distract you from your driving, but frankly, that is hard to do. That is especially so if you are not all that familiar with the functions, though I have found that the more I operate the system, the easier and less-distracting it becomes. The cabin is roomy enough upfront, but as with nearly all convertibles, the back can get a bit snug. 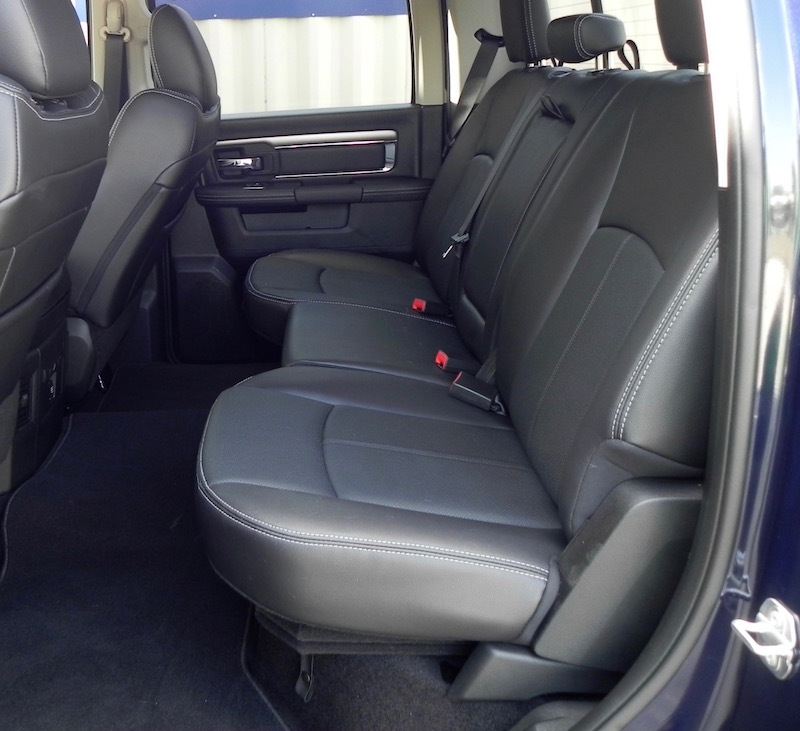 Passengers over six-feet tall may find the back cramped both in legroom and headroom (with the top up, of course), and the front-seat riders will find their legroom a bit snugger when give those in back more space. 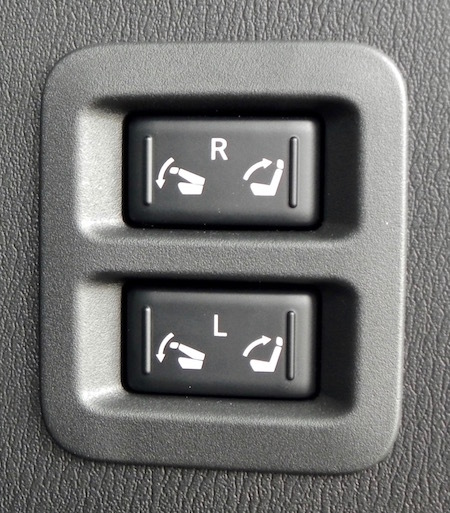 Front seats automatically move forward to free up access to the rear and then recede when the backs are returned in place. When it comes to price, all S-Series Cabriolets are six figures, but the S63 with its MSRP of $180,495 (including $995 destination and delivery) is closer to the S560’s $134,295 than the S65’s $251,895. Adding such extras as a Carbon Fiber package (carbon fiber front splitter, rocker panel inserts, mirror covers, rear diffuser insert and engine cover) for $6500, a Burlmester High-End 3D sound system for $6,400), a Driver Assistance Package (active steering assist, active lane-change assist, lane-keeping assist, emergency steering assist and other such safety features) for $2,350, Night View Assist for $2,260, Swarovski Chrystal headlight accents for $1,750, 20-inch forged AMG wheels for $1,700, and AMG Night Styling for $750 ran the total for this particular 2018 AMG S63 Cabriolet to $208,645. That’s a hefty chunk of change, but still less than the starting MSRP for the AMG S65 Cabriolet. What I liked about the 2018 Mercedes-AMG S63 Cabriolet: Pretty much everything really. It surrounds you with luxury, and despite its heft (over 4,800 pounds), it drives like a much more sprightly vehicle. The zero-to-60 time is 3.4 seconds. The only time you really notice its size (198.9 inches long, 83 inches wide including mirrors) is when you’re parking in a crowded mall lot. It’s also very quiet with the top up. 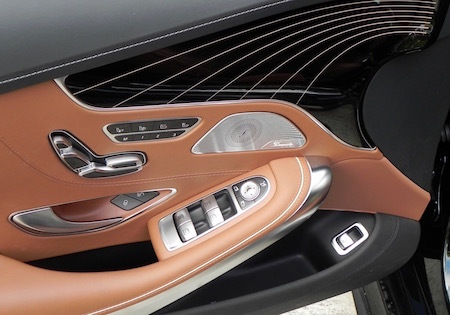 The screen for infotainment features is nicely incorporated into the flow of the dash instead of sticking up in the middle like an iPad as Mercedes has a habit of doing. Finally, the top operates (raises and lowers) at speeds up to 37 mph. 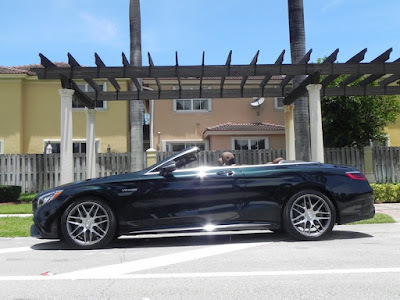 What I didn’t like about the 2018 Mercedes-AMG S63 Cabriolet: The rake of the windshield can make getting in somewhat tricky, more so for the passenger than the driver. You can easily bump your head if you’re not paying attention. As is typical of many modern droptops, trunk space is severely reduced when the top is lowered. It not that much to begin (12.4 cubic feet) and probably is no more than two-thirds that with the roof lowered. 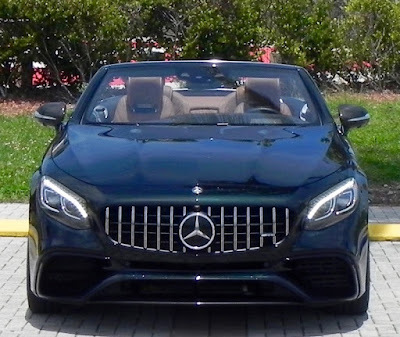 Would I buy the 2018 Mercedes-AMG S63 Cabriolet? It’s at the top of its class, so it’s where I would start if shopping in the super luxury segment, and there’s a good chance I would go nowhere else. 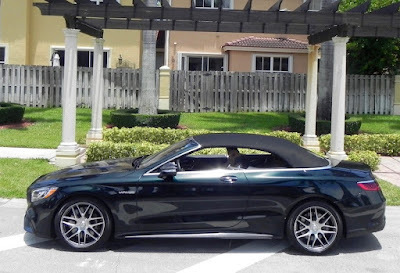 I have owned only three in my life, and I don’t own one now, but convertibles still remain my favorite kind of car. 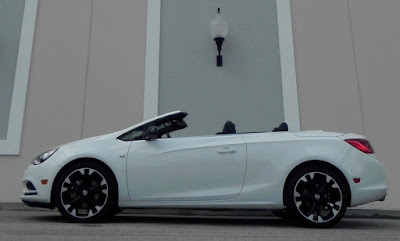 As convertible sales began to decline and some manufacturers began dropping out of the segment, especially when it came to four-seater models classified as “affordable,” I was glad to see Buick step back in after a 25-year absence by bringing the Cascada to the U.S. from Poland, where it had been manufactured in its Opel plant in Gliwice, Poland, since 2013. The international influence on the Cascada is very promient. Its engine comes from Hungary, its transmission from Korea, and the major source of parts (33 percent) is Poland (where it continues to be manufactured) to only 7 per cent for U.S./Canada. 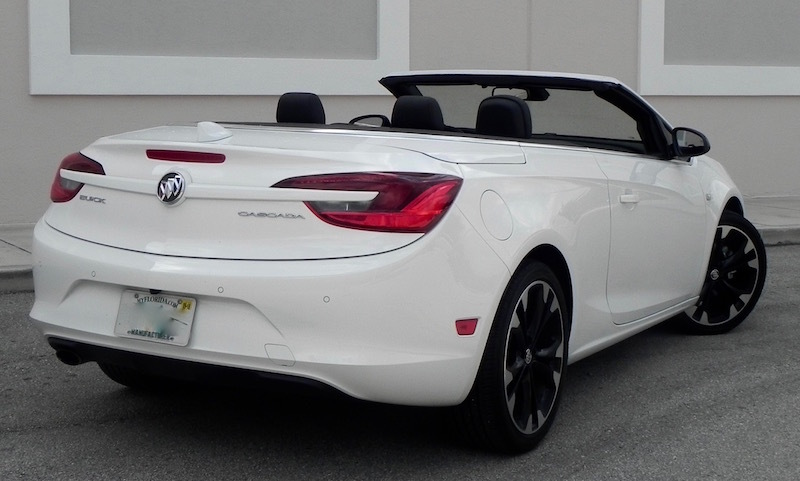 The 2016 Cascada was Buick’s first convertible since it ended production of the short-lived Reatta with the 1991 model. The Reatta had been offered in convertible form for the last two years of its existence after a four-year run as a coupe. Its short run isn’t surprising. A two-seater, the Reatta kind of looked like a Corvette somebody had put together in the dark. Not so with the Cascada. 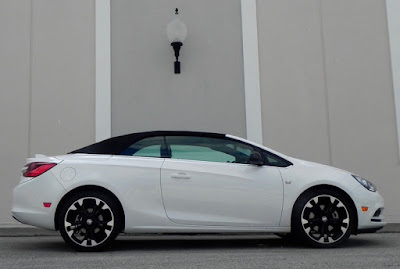 Though critics seem to have been very intent on emphasizing the Cascada’s shortcomings, convertible lovers apparently have welcomed it. According to the Buick PR folks, since its introduction the Cascada has outsold the BMW 2-Series convertible as well as the Audi A3 and A5 combined. The issue may be how long that trend will continue. Sales for the first quarter of this year (GM has gone to quarterly reports over monthly) show 918 sold following numbers of 1,442 for the first quarter of 2017 and 1,3597 for the same time period in 2016. If that pace should continue, it would project to 3,672 for the year compared to 5,595 for 2017 and 7,153 for 2016. (Numbers are from gmauthority.com). Price no doubt has something to do with the Cascada’s early sales success. 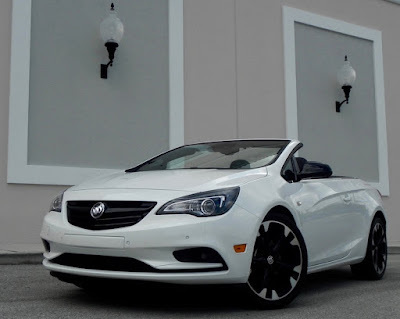 The Cascada carries an MSRP of under $40,000 and comes with many standard features that cost extra on competing makes, running their costs quickly into the $40,000 class if they didn’t start their already. The 2018 Cascada is offered as the base (called simply Cascada), Premium, and Sport Touring models with the latter starting at $37,065. For that you get a 1.6-liter, turbocharged 4-cylinder engine that is mated to a 6-speed automatic transmission, rearview camera, lane-departure warning, front and rear parking assist, leather seats, premium 7-speaker sound system with navigation, fog lights, dual zone A/C, 4G LTE wi-fi hotspot, 20-inch wheels, and an acoustically and thermally insulated roof that provides a quiet, coupe-like ride when in place. Despite the “Sport” label, the Cascada Sport Touring model is more suited for cruising around town or coasting along the highway than for sporty performance. Horsepower and torque numbers are solid enough (200 hp, 207 lb.-ft.), but that 4-banger has to move nearly two tons (3,979 pounds to be exact) of bulk. Gas mileage figures are just OK — 21 miles-per-gallon city, 29 highway, and 24 combined — and premium fuel is recommended. With all that standard equipment, the only extra on the Sport model I had for a week was a “Dark Effects Package” that included red stitching on the seats, doors, and dash and black trim in the same places plus gloss black mirror caps and grille. Cost for that was $125. Throw in the $925 delivery charge and the total came to a very competitive $38,115. What I liked about the 2018 Buick Cascada: You can operate the top, raising or lowering, at speeds of up to 31 mph. This is especially a welcome feature if a late afternoon shower catches you by surprise. Its compact size (184.9 inches long with a wheelbase of 106.1 inches) makes it comfortable in tight surroundings. 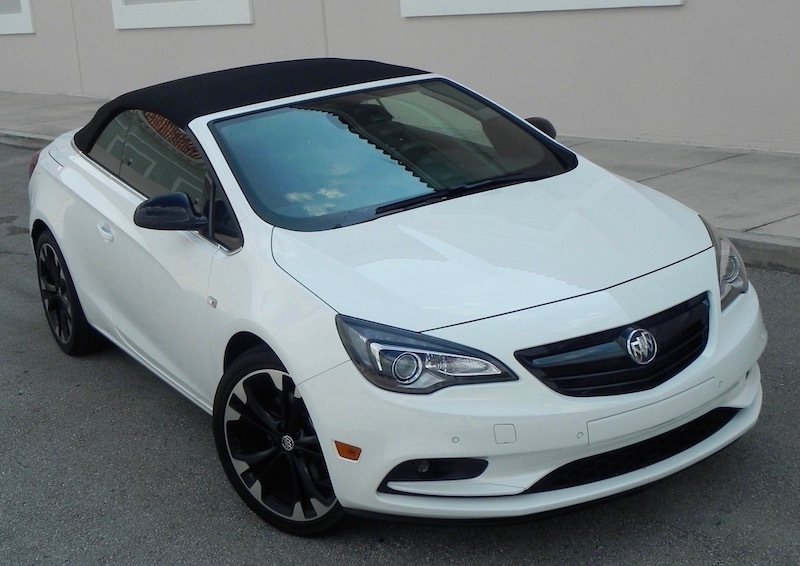 Would I buy the 2018 Buick Cascada? Frankly, I am conflicted here. It is a convertible, after all, and I applaud Buick’s efforts to get back into the segment so that is very much in its favor with me. I just wish it had paid more attention to small things (like keyless operation). It seems like the intent was to keep MSRP below $40,000 at all costs (pun intended) even if that meant some features had to be eliminated. Considering the sparsity of four-seat convertibles, it’s worth a look if you’re in the market for a droptop suitable for a small family. One afternoon some time back I was sitting in an establishment enjoying an adult beverage and happened to be overhear a couple of guys discussing pickup trucks. For the record, it wasn’t that I was eavesdropping. It’s just that we were the only people there save for the bartender, and it wasn’t a very big bar. The Chevy guy laughed, scornfully, You would have thought I had asked him to take Ford’s side and the Ford guy to pledge his loyalty to the bow tie. Or worse. So I dropped out of the discussion and went back to more relevant issues, like should I have another adult beverage before leaving. I shouldn’t have been surprised by that reaction. According to a recent survey by Edmunds.com, a leading auto website, 74 percent of those buyers who purchased a new pickup last year bought the same type of vehicle, if not the same model, they had previously owned. Only SUV buyers (75 percent) were more loyal in sticking to the same type/model that they were trading in. Chances are, you may feel the same way, and I’m not going to try to persuade you otherwise. I’m not a car salesman, just a car reviewer. 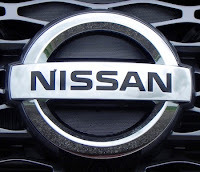 But I will say that you might want to do yourself a favor and check out what you may be missing by expanding your shopping horizon beyond the traditional segment leaders Ford and Chevy. 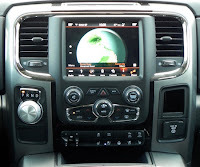 The Ram 1500 is a very capable vehicle, especially the 2019 model which gets some serious upgrades especially in the way of technology and driver assistance features that included a new 12-inch touchscreen with two displays to operate infotainment functions and such safety systems as a surround-view camera, adaptive cruise control, and blind-spot monitoring. 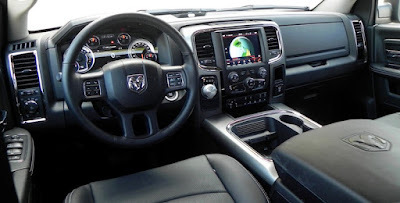 But if you can live without techno-gadgets, you can get many of a pickup’s basic benefits and capabilities from the current 2018 Ram 1500 and perhaps even get a better deal. Certainly there is enough to choose from. 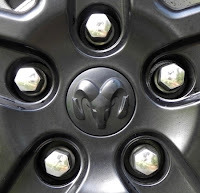 The 2018 Ram 1500 is offered in 11 different trims from the base Tradesman to a new top-of-the-line Limited Tungsten with MSRP running from just over $27,000 to just under $54,000. Three engines are offered with a 3.6-liter Pentastar V6 as standard. 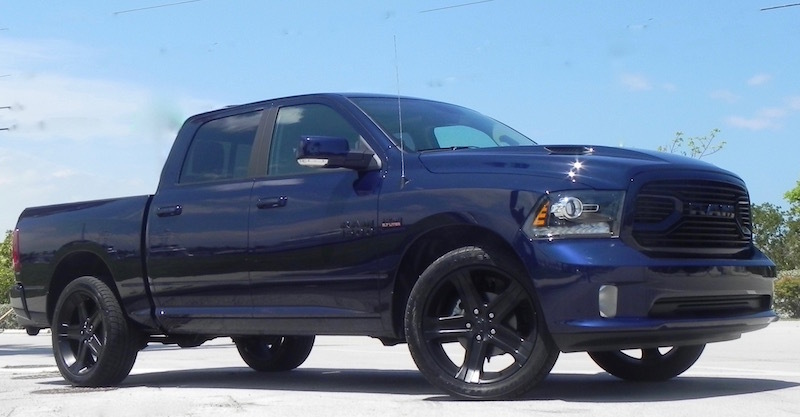 A 5.7-liter HEMI V8 and a 2.0-liter turbodiesel V6 also are available. All are mated to one of two 8-speed automatic transmissions shiftable via buttons on the steering wheel cross bar, and four-wheel-drive models have a low-range transfer case for off-road excursions. Only one size bed (6-feet-4) is offered on Quad Cab models, but you can choose from two beds for regular cab models (8-feet and 6-4) and Crew Cab (5-7 and 6-4). 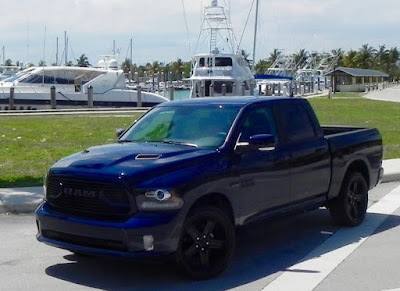 I recently spent a week in the Ram 1500 Sport Crew Cab 4X2 with the HEMI V8 and several stand-alone options and optional packages that ran the total cost from the base MSRP of $40,795 to $53,690. 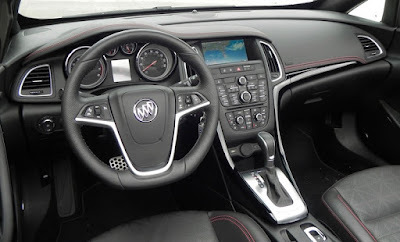 Those extras included with leather-trimmed bucket seats, heated and ventilated front seats, keyless entry and push-button start, automatic high beam control, rain-sensitive windshield wipers, power sunroof, rear defroster, UConnect 4C Navigation with an 8.4-inch display, 22-inch wheels, and a parking assist program. 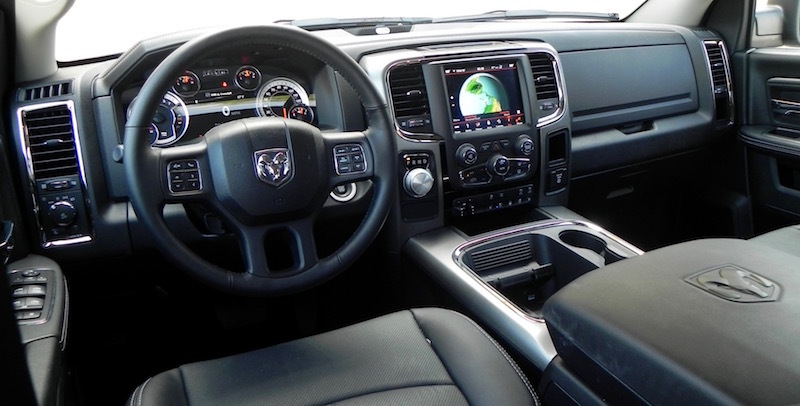 Included in standard equipment are a rear backup camera, rotary shifter, Apple CarPlay and Android Auto, leather-wrapped steering wheel, power adjustable pedals, 10-way power adjustable driver’s seat with lumbar support, second-row storage bins, LED bed lighting, and fog lights. In addition to the quietness and ride, the cabin is very roomy with a big storage bin on the console. 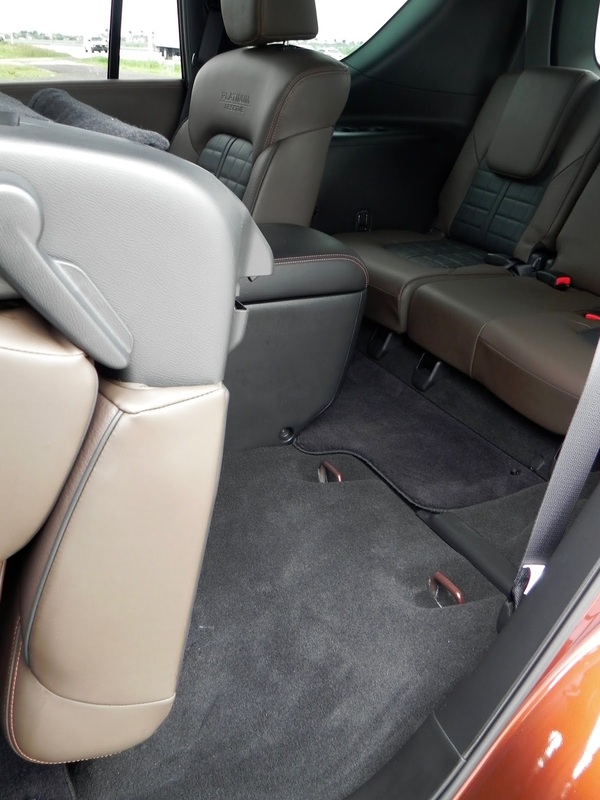 Front riders get 41 inches of legroom in all trims, including Regular Cab, while second-row occupants get 34.7 inches in Quad Cabs and 40.3 in Crew Cabs. 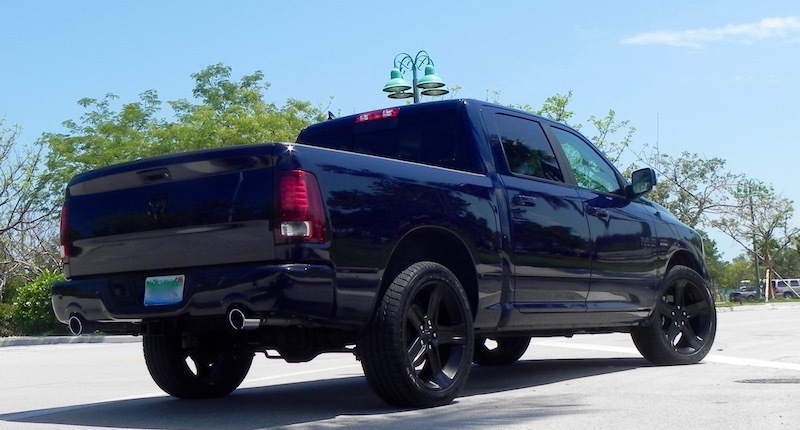 Essentially, it makes the Ram 1500 an SUV with a open bed for hauling stuff. What I liked about the 2018 Ram 1500 Sport Crew Cab 4X2: The technology is very user-friendly, and the ride is exceptionally smooth for a pickup. 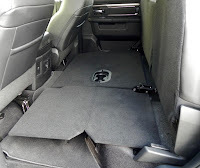 The rear seats flip up to provide an expanded, flat-floor stowage area. What I didn’t like about the 2018 RAM 1500 Sport Crew Cab 4X2: With no running boards (available only as options on a couple of models for 2018 and a few more for 2019) getting up into the cabin can be a chore. Grips on the A-pillars help, but running boards would be a big plus. 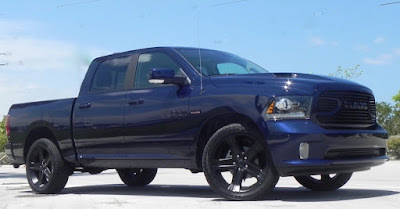 Would I buy the 2018 Ram 1500 Sport Crew Cab 4X2? Well, I’m not a truck guy, so not for me. But if you are one, don’t be like the guys in the Ford-Chevy debate and limit yourself. You may stick with a Ford or Chevy, but you should do yourself a favor and give the Ram a look. A couple of months ago I had the pleasure of spending a week behind the wheel of a Genesis G90 sedan. You can look up what I had to say about it by going to the archive of my blogs I wrote in March and clicking on where the list is garbled. Garbling of headlines happens sometimes when I file the blog on the site. Instead of the actual headline, a sequence of computer commands pops up, and there doesn’t seem to be anything I can do about it. If you want to read about the G90, just go to the next-to-last entry for March. 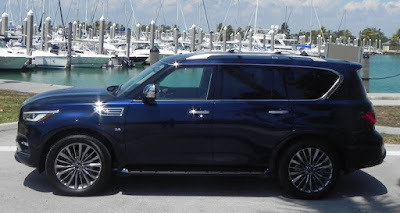 It’s between my review of the BMW 740e and the Lincoln Navigator I had for a drive to Key West. A short take on the review: I liked it and found it to be a legitimate competitor in a class that includes top-of-the-line luxury German imports, even though it bears an MSRP that several thousand dollars lighter. Dating back to the 2009 model year, Genesis has become Hyundai’s luxury outlet which, in addition to the G90, also includes the G80. They are both fine cars, but that’s a pretty slim portfolio. Fortunately, more are in the works over the next couple of years, including a couple of crossovers/SUVs. A midsize sedan, the G80 is very much like the full-sized G90 only in a slightly smaller package, which, frankly, I find appealing. 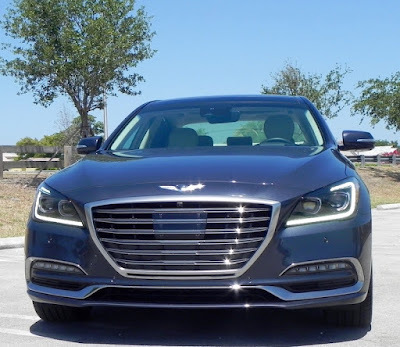 It essentially is an updated version of the vehicle that carried the Genesis name under the Hyundai banner for the first eight years of its existence. Designers gave the G80 several serious upgrades for 2017 and expanded the lineup to include a turbocharged Sport trim. 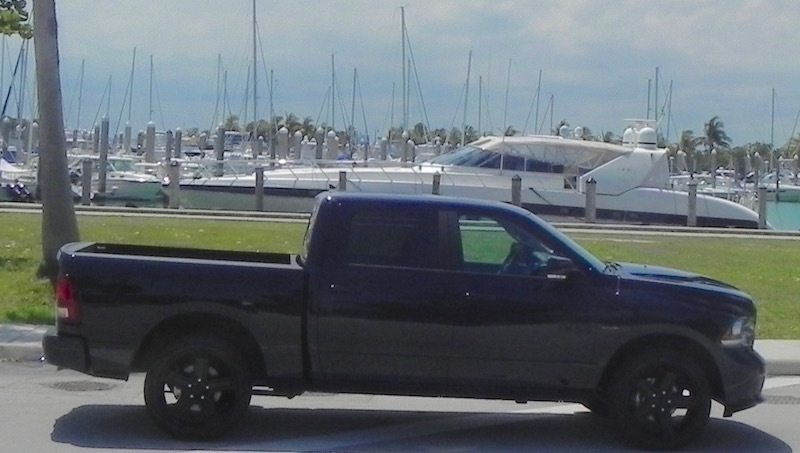 The base model remains the 3.8 (with a 3.8-liter V6 rated at 311 horsepower and 293 pound-feet of torque) with the 5.0 at the top of the food chain (5.0-liter V8, 420/407 hp, 383/372 lb.-ft., depending on the fuel (premium/regular). The 3.3T sits in between. Its turbo V6 is rated at 365 hp, 376 lb.-ft. using premium fuel. 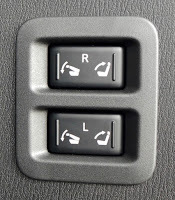 All-wheel drive also is offered on all trims. I was treated to the G80 RWD 5.0 Ultimate edition. 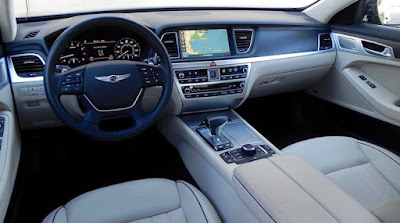 At 196.5 inches long, the G80 is nearly a foot shorter than the G90, but with a wheel base of 118.5 inches to the G90’s 124.4 inches there isn’t a whole lot of compromising when it comes to cabin space. Passenger volume for the G80 is listed as 107.7 cubic feet to the G90’s 113.2. The G80 offers 45.7 inches of legroom up front and 35.0 in the rear to the 46.3 and 37.8, respectively, found in the G90. Like the G90, the G80 offers a long list of standard features. 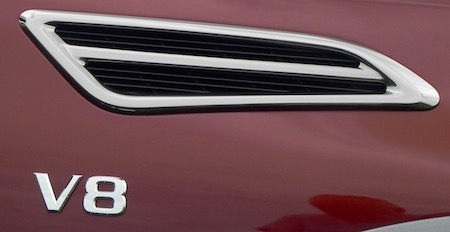 All three trims get as standard such items as push-button start, an 8-speed automatic transmission with four drive modes (ECO, Normal, Sport and Snow), tilt-and-telescoping steering wheel with paddle shifters, rear-wheel drive with optional all-wheel, multi-link front and rear suspensions, emergency braking assist with pedestrian detection, lane-departure warning and lane-keeping assist, electronic parking brake with automatic hold, high-beam assist, full LED headlights, LED tail lamps, hands-free trunk opener, rain-sensing wipers, dual A/C, Bluetooth hands-free phone system, 3 years Genesis Connected Services, and Android Auto and Apple CarPlay. 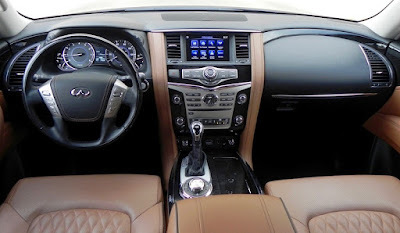 The 5.0 adds such features as a 9.2-inch high def screen for the navigation system in place of an 8-inch display, a multi-view camera, heads-up display, manual side rear window screens, premium leather seats, 16-way power adjustable driver’s seat, and 19-inch premium alloy wheels over the 18s on the base model. In other words, just about any and every feature you might expect in a top-of-the-line luxury sedan is found on the G80. As you might expect, there is a price bonus with the G80 starting at under $42,000 and the G90 base starting at over $68,000. 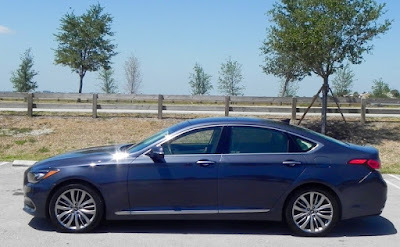 My (I wish) 5.0 Ultimate had a total MSRP of $57,975, which is nearly $14,000 less than the G90 RWD Ultimate and came with all the features listed, eliminating the need for option packages. 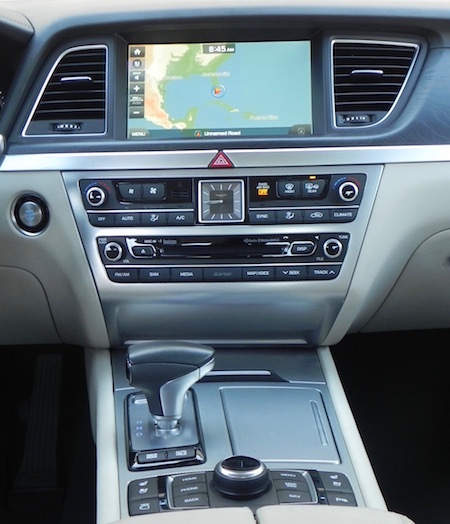 What I liked about the 2018 Genesis G80 RWD 5.0 Ultimate: The cabin interior is nicely done with real wood and aluminum trim. 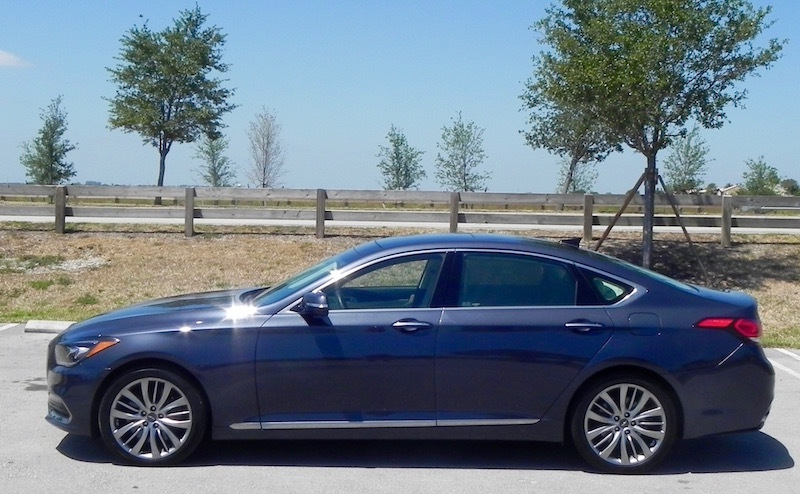 There is plenty of technology, and following in parent company Hyundai’s tradition, it is all very user-friendly. 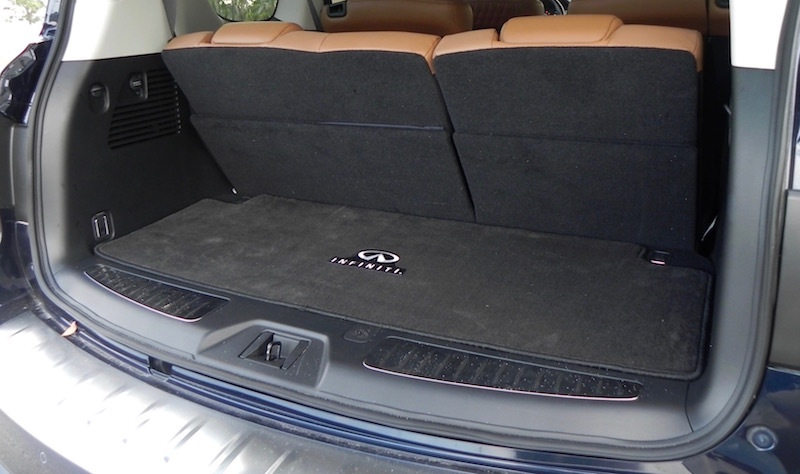 The trunk (15.3 cubic feet) is nearly as spacious as that in the G90 (15.7 cubic feet). 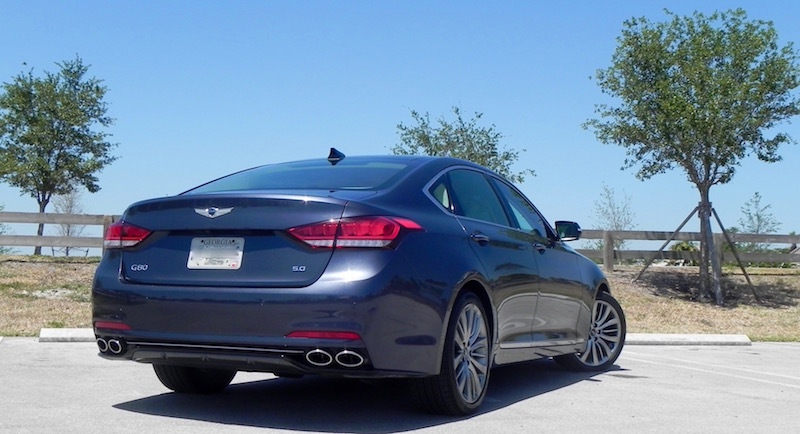 What I didn’t like about the 2018 Genesis G80 RWD 5.0 Ultimate: Not much to nitpick on here. Gas mileage (16 mpg city, 24 highway, 19 combined) could be better, but if you don’t mind giving up a bit of power, you can run it on regular fuel. 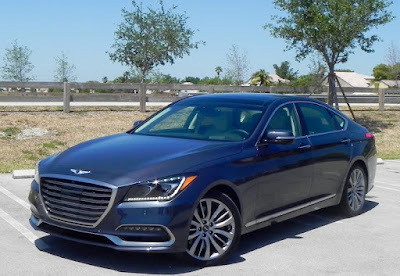 Would I buy the 2018 Genesis G80 RWD 5.0 Ultimate? In a heartbeat. I like its sportier handling over the G90 and would appreciate saving a few bucks. If you had gone by what was being said about them a decade or so ago, you would have thought that full-size SUVs, like the dinosaurs that provide them the fuel to run on, would be extinct by now. High fuel prices gave even those consumers who had a legitimate need for such a big vehicle reason to pause and rethink their potential purchase. But, unlike the dinosaurs, the full-size SUV has survived, thank you very much, because there are so many things they do better than other vehicles — like hauling passengers and lots of cargo and towing and going off-road. As rugged and functional as the full-size SUVs are, they also can be luxurious and refined, like the Infiniti QX80, which the luxury division of Nissan introduced as the QX56 for the 2004 model year and rebadged in 2014 to follow the company’s new naming convention. It has been around for a while so designers and engineers have had some time for tinkering over the years. 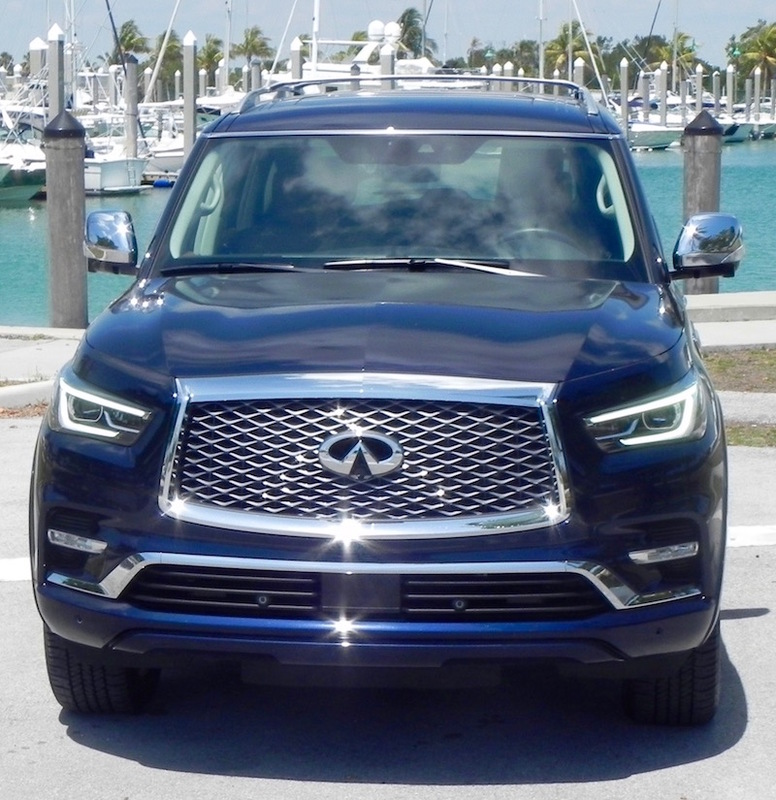 For 2018, the QX80 gets a makeover for the exterior with a more angular look and a slightly higher (20 mm, or about an inch) ride than the outgoing model. The flat hood is longer, and new LED headlights and fog lights grace the front fascia and new, thinner LED taillights the rear. At 208.9 inches in length, it is slightly longer than some of its competitors, yet it has a smaller feel about it. Not small, mind you, but not overly bulky either. It’s a great expressway cruiser, and the only time you may really be conscious of its size is when you’re in a tight mall parking lot or garage. It gets plenty of power. 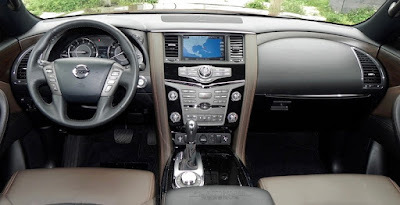 A 5.6-liter (hence the former QX56 designation) V8 engines is mated with a 7-speed automatic transmission and produces 400 horsepower and 413 pound-feet of torque, which is plenty of power. Infiniti clockers caught the QX80 from zero-to-62 mph (yes, 62 mph; beats me) in 7.5 seconds. In two-wheel-drive configuration mileage figures are 14 miles-per-gallon city, 20 highway and 16 combined. With 4WD, the numbers are 13/19/15. 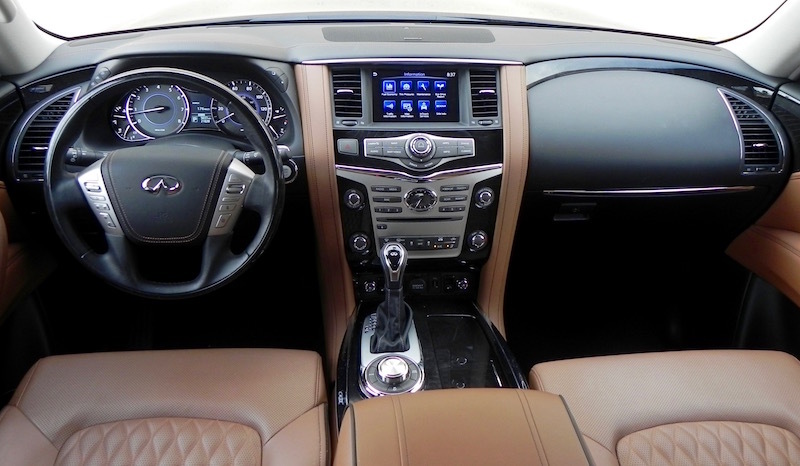 A dial on the console switches the QX80 4-wheel drive models from automatic to high 4-wheel level to low 4-wheel for more adventurous off-roading. There also are settings for Snow and Tow mode. It can tow up to 8,500 pounds. 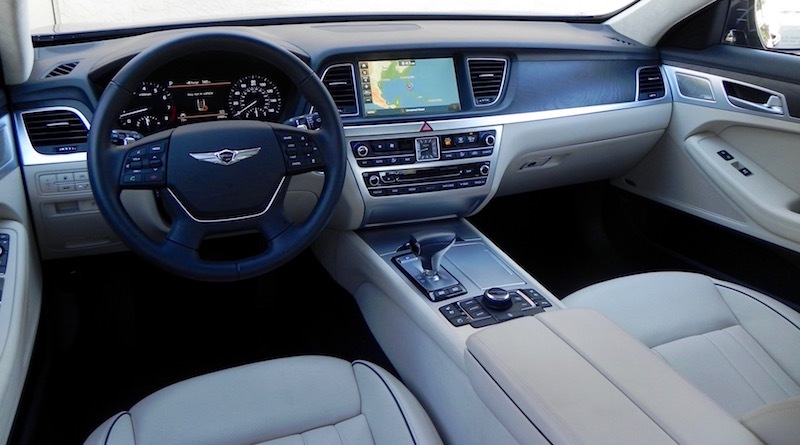 Inside, the cabin exudes an air of refinement, from the analog clock in the middle of the center stack that catches your eye as you climb into the cabin to the comfortable seats that provide two-way lumbar support for both the driver and the passenger. There’s plenty of room in the cabin as well, with those in the front getting up to 39.6 inches of legroom and those in the second row up to 41. Third-row occupants are a bit more crowded with only 28.8 inches of legroom. Handles mounted on the A-pillars are helpful in getting in and out, and the second-row captain’s chairs easily tilt forward to allow access to the far back, though that doesn’t necessarily make it easy for an adult to get back there. A common complaint among several reviewers is that the technological features are a bit dated and not up to the competition, but frankly I’m not sure what those critics were looking for. I came to drive, not play computer games or watch a movie. Too often, the latest technology just complicates things. 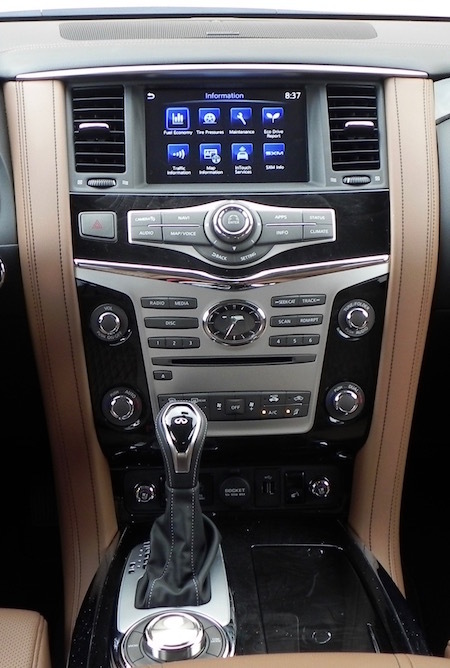 In the QX80, I found audio, climate, and navigation systems easy enough to operate. Knobs can be used to adjust audio sounds and radio stations as well as blower and A/C temperature! Hooray for knobs! Standard equipment includes Bluetooth communications, navigation with 8-inch touchscreen display and voice recognition, power tilt-and-telescoping steering wheel, two storage compartments in the console, a second-row console with storage compartment and 12V outlet, power rear liftgate, remote engine start, roof rails, and a Bose 13-speaker premium sound system. That was included in the base MSRP of $67,850 for the 4WD model that served as my test vehicle. Adding option packages like a Deluxe Technology Package (which added two more speakers for the audio and leather-appointed seats with quilting), a Theater Package (heated second-row seats, dual 8-inch monitors and two wireless headphones), 22-inch wheels, a Driver Assistance Package (backup collision intervention, blind-spot and lane-departure warning, Forward Emergency Braking with pedestrian detection, and Intelligent Cruise Control) ran the final total to $84,660 including $995 for destination and delivery. 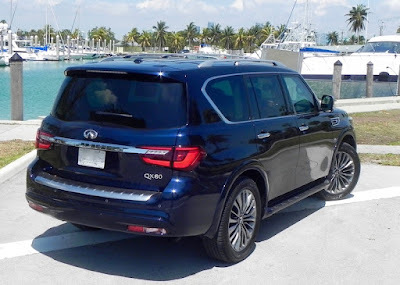 What I liked about the 2018 Infiniti QX80: Too often, third-row seating infringes greatly on rear storage capacity, but not-so much with the QX80. There’s 16.6 cubic feet behind the third row and 49.6 when the third-row seats are folded. Those seats are power-folded, by the way, also a nice feature. What I didn’t like about the 2018 Infiniti QX80: I wouldn’t want to have to ride in the third row very often. Though the captain’s chairs fold easy enough, it’s still not easy to get back there. 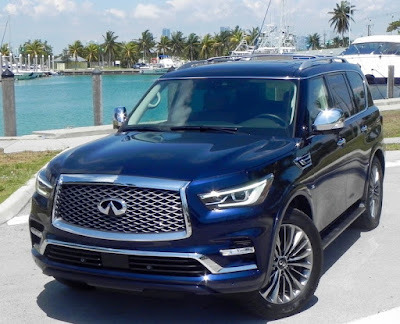 Would I buy the 2018 Infiniti QX80? I don’t have a need for a vehicle this size, but if you do, you might want to look past the usual suspects and check it out. It has an air of quality and refinement about it that I find appealing.